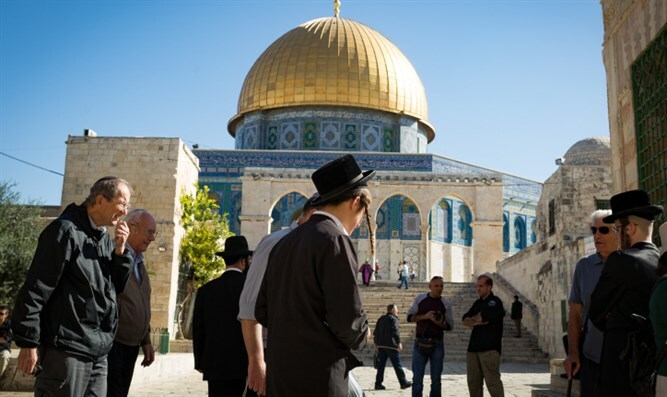 Jordanian Foreign Minister says Jews visiting their holiest site could cause more violence and riots. Jordanian Foreign Minister Ayman Safadi slammed the Jews who visited the Temple Mount today (Tuesday). Approximately 1,300 Jews ascended the Temple Mount today (Tuesday), on the fast of Tisha B'Av, setting a new record for visitors on a single day. The fast, which takes place annually on the ninth day of the Hebrew month of Av, commemorates the destruction of the two Holy Temples by the Babylonian and Roman empires in 586 BCE and 70 CE, respectively. Religious Jews refrain from eating and drinking for a 25 hour period of mourning. They also refrain from wearing leather shoes and bathing and do not sit on anything higher than a 1-foot high stool until midday. They do not greet one another on the eve of the fast and there is no Torah study because it gladdens the heart.